A technology demonstrator for a new type of electric delivery vehicle – which could make the courier industry greener and more efficient – has been developed by WMG at the University of Warwick and Warwickshire-based design company Astheimer Ltd.
Based on the platform of a Renault Twizy, the DELIVER-E is a quiet, compact, lightweight electric vehicle, ideal for navigating urban environments, addressing issues like congestion, noise, pollution – and responding to the demands of an ever-growing shift to online shopping. This prototype allows cutting-edge WMG research outputs to be shown in a real, driveable vehicle. Astheimer developed the WMG concept to create a unique vehicle exterior – by enlarging its rear storage area, giving it space for three online delivery baskets. They also added new body panels to the DELIVER-E, and fitted it with programmable LED pixel strips, which can change colour for brake and indicator lights. 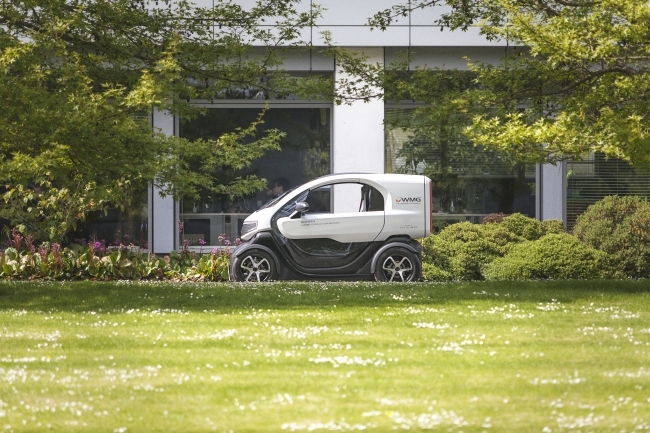 Carsten Astheimer, founder and creative director, Astheimer Ltd said: “The DELIVER-E is the result of an intensive ten week collaborative project between Astheimer and WMG to design and build an electric delivery vehicle prototype. This unique collaboration showcases the design and prototyping capabilities of Astheimer.